December 12, 2017 – New York, NY. 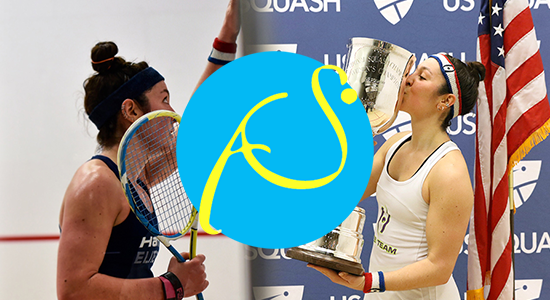 The highest-ever ranked American-born squash player Amanda Sobhy will make her comeback from a torn Achilles tendon to lead a trio of USA women at the J.P. Morgan Tournament of Champions (ToC), January 18-25, 2018. The announcement today by tournament officials of the confirmed entries for the 2018 ToC marks the first time in tournament history that three American women have ever made the ToC main draw or a PSA World Series main draw. Sobhy was ranked No. 6 in the world in March when she ruptured her left Achilles during a match. The 23-year-old from nearby Sea Cliff, L.I. had surgery on March 17 and was off the Professional Squash Association (PSA) world tour through the rest of the year. Sobhy was the 2016 ToC runner-up. Joining her at the 2018 ToC will be world No.12 Olivia Blatchford of Wilton, Ct., who is the only American, male or female, to have made it into the second round of the 2018 World Championships. Teen sensation Marina Stefanoni of Darien, Ct. rounds out the American trio. The 15-year-old Stefanoni, awarded the wild card entry into the main draw, is the youngest player ever to hold the US National Under 19 Singles title, which she won in 2016 and 2017. Headlining the women’s field are World No. 1 Nour El Sherbini of Egypt and her countrywoman world No. 2 Raneem El Welily, along with world No. 3 and defending ToC champion Camille Serme of France. The men’s field will be led by world No. 1 Gregory Gaultier of France, No. 2 Mohamed Elshorbagy of Egypt and his countryman, No. 3 Ali Farag. Todd Harrity of Philadelphia, Pa, the highest-ranking American man on the PSA tour, received the wild card entry for the men’s draw. Including Malaysia’s Nicol David and England’s Laura Massaro, along with El Welily, there will be three former world no.1s in the women’s draw. On the men’s side, there will be five former world no. 1s (each of whom has won the ToC title) competing in Grand Central – defending champion Karim Abdel Gawad and his countrymen Ramy Ashour and Elshorbagy; and Englishmen Nick Matthew and James Willstrop. The ToC has long been a favorite player stop on the PSA World Tour as the iconic Grand Central venue and the sold-out crowds affords the players the opportunity to showcase their talent and competitive drive in front of tens of thousands of spectators each day. “Playing at the ToC is the closest squash players get to feeling like rock stars,” said Matthew, the 2012 ToC winner and three-time world champion. The 2018 ToC field includes players from 26 countries and also includes 20 current or former players at 12 American universities. Harvard and Princeton will each be represented by four players. The Harvard contingent includes Amanda Sobhy (’15), Ali Farag (’15), Haley Mendez (‘15) and Sabrina Sobhy (’19). The Princeton crew includes Todd Harrity (’13), Nicole Bunyan (’16), Olivia Fiechter (’19) and Youssef Ibrahim (‘21). Columbia University has two players in the qualifying draws – Ramit Tandon (‘15) and Reyna Pacheco (‘16), as does Trinity College – WeeNee Low (’14) and Kanzy El DeFrawy – (’16). The qualifying draws will also include: Millie Tomlinson – Yale (‘14), Danielle LeTourneau – Cornell (‘15), Tiffany Hau – Middlebury College (’16), Mary Fung-A-Fat – Drexel (’17), Chris Hanson – Dartmouth (’13), Dylan Cunningham – Franklin & Marshall (’16), Faraz Khan – University of Rochester (‘16); Andrew Douglas – University of Pennsylvania (’21). The J.P. Morgan Tournament of Champions is one of eight World Series events sanctioned by the Professional Squash Association (PSA), one of five to offer equal prize money and draw size for both men and women, and the only one to have been staged in the same venue for two decades. The ToC features a 32-player main draw and a 32-player qualifying draw. Fans will be able to catch the action in Grand Central from the ticketed seats in the stadium, free standing room at the front wall or on closed circuit TV screens in Great Northern Food Hall on the west side of Vanderbilt Hall. Squash is contested in all the major international multi-sport regional games and has been rated by Forbes magazine as the healthiest sport based on cardiorespiratory endurance, muscular strength, flexibility, muscular endurance, calories burned and risk of injury. The sport was first played in England more than 140 years ago and is now popular in 185 countries, with nearly 50,000 squash courts worldwide. There are more than 16 million squash players around the world and more than 1,500,000 in the United States.